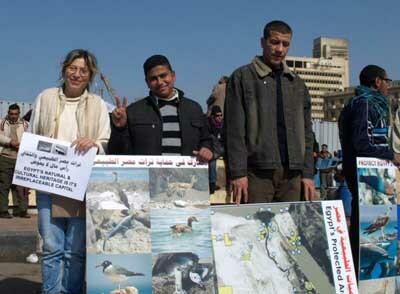 Dina Zulficar, Egyptian animal rights activist, writes, on the occasion of the first anniversary of the Egyptian Revolution, celebrated in Tahrir Square, “A banner, 30 meters long, illustrated the protected 29 areas of Egypt. We gave out many pamphlets with slogans, three big posters illustrating wildlife and a map showing the protected areas. People of many different ideologies responded. We ended up being joined by a great many supporters! “Gabriel Mickael, bio-engineer, is the one who called for the event, and made the 30- meter banner.” Prominent Egyptian environmentalists were present, as well, at the celebration. To visit the Facebook page of AWAR, the organization founded by Dina Zulficar, click here. 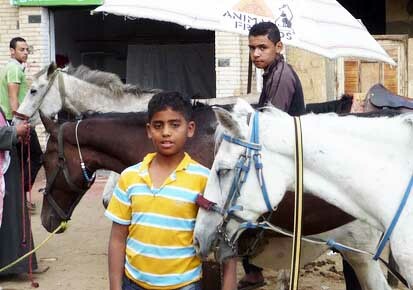 Ahmed El Sherbiny, Chairperson of ESAF (the Egyptian Society of Animal Welfare) writes: “Since 2005, ESAF has conducted a weekly clinic in the Pyramids area for horses, donkeys, and now camels. However, after the revolution [when the horses were starving first due to civil unrest and the curfew, then because of the collapse of tourist trade income], we increased the clinic to three times a week and included feeding…. “As part of our long-term plan, ESAF has now opened a permanent clinic, not far from the Pyramids. This clinic operates seven days a week, from 9 am till 5 pm, providing both feeding and treatment for horses and camels in need. To visit ESAF’s Facebook page, where you can offer to help the Pyramids horses and camels, click here. 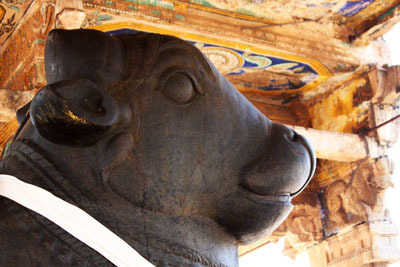 At Brihadeshwara Temple in Tamil Nadu, Nandi, the sacred bull, guards the entrance, just as he has guarded the entrances to all Shiva temples for thousands of years. Like the cow, the bull has always been revered and honored in India. In modern times though, there have sprung up more recent “traditions”, such as sporting events (some known as jallikattu) in which bulls are forced to participate and which are very cruel to them. 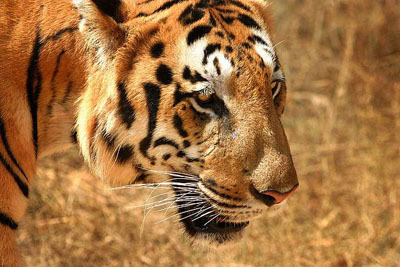 It is sad to see this happening in India, since it goes against the time-honored respect that India holds for all life. Within a couple of days there will be a court case to determine whether bulls should be used in these various kinds of sporting events in the southern state of Tamil Nadu. All these events, like bullock cart racing and jallikattu, subject the bulls to suffering and abuse. It is not natural for bulls to race, so they must be mistreated to get them to run. A few months ago, the Hon’able Jayanthi Natarajan, one of the ministers of Tamil Nadu, was instrumental in passing a ruling that bulls should not be used in sports events as performing animals. However, as you can imagine, those who are profiting from using the bulls in races, would like to continue these events, and they have been very active in making their voices heard. So it would be helpful if all of us can make known our wish that the bulls should be treated with kindness, respect, and compassion and not be used in racing, which is inhumane. Please send an email, thanking the Minister for the ruling she issued banning bulls from being used as performing animals and expressing your wish that bulls may continue to be protected from having to participate in any sporting events. Below is the letter that I sent. Please use the same form of address, but please do not use my words, since it will be more effective to use your own words. The points made can be the same. The email address is mosefgoi@nic.in Thank you for taking this step to help the bulls in India. I was very happy a few months ago to learn that your Ministry had issued a notification banning the use of bulls in performing. This is an extremely important issue because India is known throughout the world as a country that respects animals, especially cows and bulls, who are so abused in much of the world, for example, by being slaughtered for food. It is essential that India set an example for the rest of the world by ensuring that bulls are never used in any kind of sports events, races, or contests, or in any similar ways that could cause suffering to them. Bulls must be honored, respected, and allowed to live in peace. Only by honoring and caring for animals can we as humans create a society where there is peace and well-being. Thank you for ensuring that bulls in Tamil Nadu will be safe and well-cared for and for preserving and protecting the noble traditions of India, which always show kindness to animals. This link will take you to a wonderful, absolutely charming video spoof, by Greenpeace India, sung by a tiger and a bear, to protest the destruction of forests in central India, by coal mining. To watch the video, click on the first link above at the top.